It is 6:30 a.m. on Tuesday, March 17. Happy St. Patrick’s Day! Instead of shamrocks and leprechauns, I present to you skewered scorpions, starfish, sea horses, silk worm cocoon kebabs and more! These are just a few of the many tasty treats sold in the bustling food market section of Wangfujing Street. Gluten free and protein rich, could fried scorpions be the next new trendy specialty diet snack? I won’t hold my breath for that to happen. 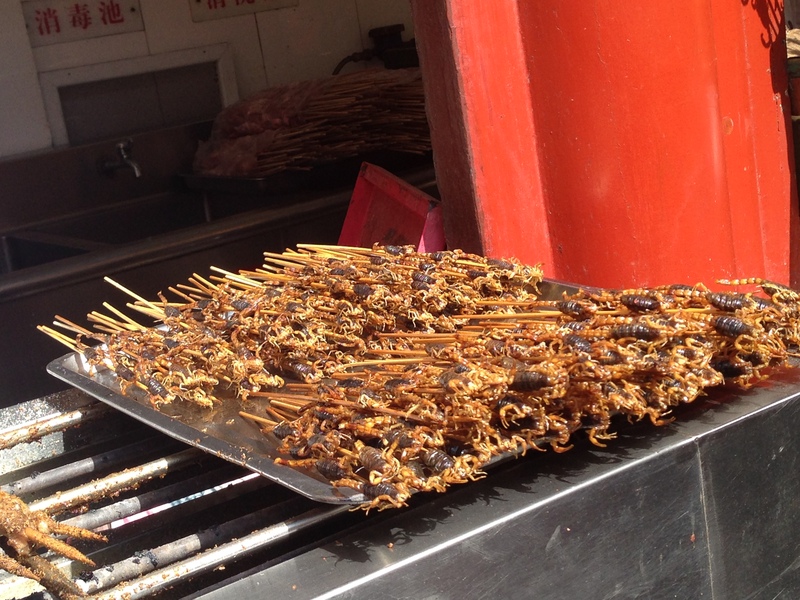 If fact both foreigners and Chinese passers-by seem more apt to snap a photo of the arthropod appetizer than to hand over their yuan and sample it. But there were a brave few who seemed to be enjoying the odd delicacy. Here the scorpions are fried and ready to eat. Though squirmming and poisonous before meeting their grilled end, cooking is said to render their sting ineffective. One would hope so! Necessity is the mother of all invention, as the saying goes. You’ll pass on the scorpions, you say? Well how about a skewered starfish? Or maybe a silkworm cocoon kebab is more your thing? A bit squeamish, not to worry. There are plenty of less intimidating offerings like baozi and grilled squid at the market for the faint of heart (myself included). But be warned, it’s tourist prices you’ll pay. Still, the spike in prices are worth it to be able to sit and enjoy the sights surrounding you. Since landing on this side of the planet, our days have been full of new sights, sounds, tastes and experiences. Chris, having lived in China before, has been a trustworthy navigator, easing the daily challenges and confidently co-piloting our adventure. We have much more to report from the last few days, so stay tuned. For now, I leave you with some photos from the sensory playground that is the Wangfujing market. Counting the days. We can’t wait to visit Wangfujing market :D. And like chasingGains already said..looks fun to try..hihi. Howdy! I could have sworn I’ve visited this blog before but after going through some of the posts I realized it’s new to me.